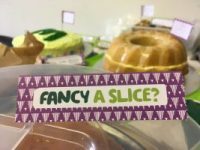 Coffee, cake and charity fundraising! 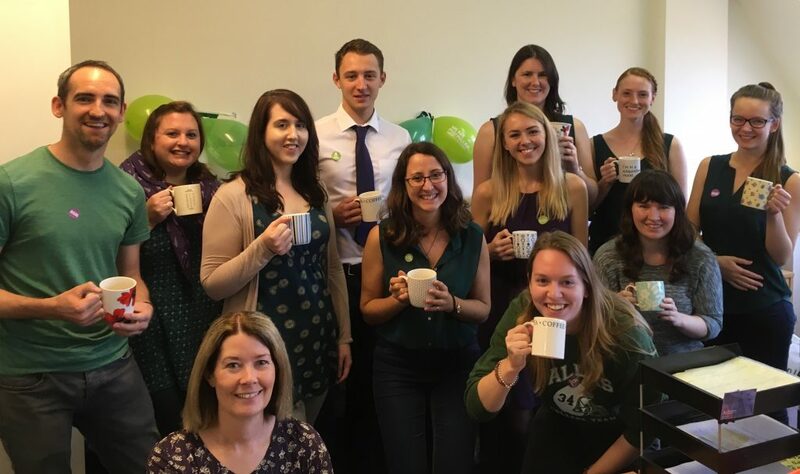 On Friday 29 September 2017, we hosted our third ‘virtual’ coffee morning as part of Macmillan Cancer Support’s annual “World’s Biggest Coffee Morning” charity event. Our freelance translators, friends and families joined in by sharing their coffee break photos with us, enabling us to truly reach around the globe! Parallel received photo submissions from as far afield as Australia, Japan and Argentina, as well as many more closer to home. It was lovely to be able to put faces to names and get to know everyone a little better. 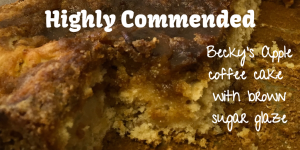 In the office, we spent the day drinking lots of coffee and eating plenty of cake, much of which had been entered into our Bake Off competition. 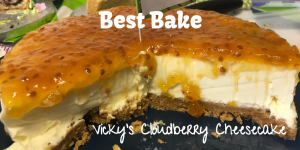 Vicky won the title of ‘Best Baker’ this year with her cloudberry cheesecake, and Becky earned the ‘Highly Commended’ prize with her apple coffee cake. The team also enjoyed winning a variety of prizes during our popular lunchtime raffle. This exciting event was organised in aid of the Macmillan Cancer Support charity, which aims to make sure no one faces cancer alone. The charity provides medical, emotional, practical and financial support for the 2.5 million people in the UK living with cancer. 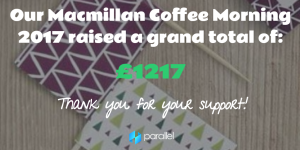 Thanks to the generous donations to our coffee morning event, Parallel raised a grand total of £1217. Thank you for your support!